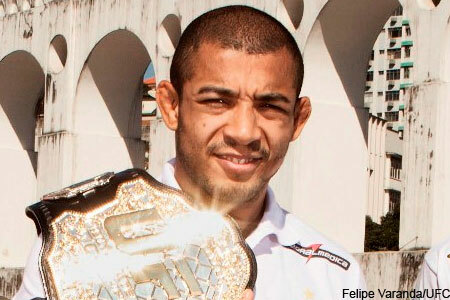 The UFC is efficiently clearly every major hurdle in order to arrange a blockbuster bout between lightweight champion Anthony Pettis and featherweight king Jose Aldo (pictured). After Aldo collected his eighth straight WEC/UFC title defense by cruising past Ricardo Lamas at UFC 169, UFC president Dana White said the ideal scenario would be for Aldo to vacate his 145-pound crown and challenge Pettis for his throne. However, Aldo is reluctant to do so for several reasons, most notably money. When it comes to fighter compensation for UFC pay-per-views, champions score a piece of the PPV pie, while the challenger is often on the outside looking in. Since Aldo would enter the shootout without any hardware, he was worried that would be the case for him. Clearly, that wouldn’t be beneficial from a bank account perspective, as a bout between Pettis and Aldo is expected to be of the box office variety. Well, it appears White quickly erased that obstacle right off the road. If Aldo decides to dive into the lightweight pond, White said former top contender Chad Mendes and Cub Swanson would likely fight for “Scarface’s” abandoned belt. If Aldo loses to Pettis, he would then move back down to immediately challenge the new champ to reclaim his featherweight crown. Pettis is currently rehabbing his surgically-repaired knee. He is expected to be sidelined until July.